There is a big shift in the job market today. More people are opting out of the traditional 9-5 job for 5 days a week, for taking on short term employment – or gigs – as a career. These gigs can take people all over the world, giving them an opportunity to travel and experience new work environments. It also enables people to have more control over their profession. With the freelance or gig economy, you have the freedom to choose what you would love to do and at your own pace. People who love to travel or pursue different or highly specialised careers are usually inclined towards freelance or gig work. What could be better than deciding your own schedule and travelling while you make some money? And that’s where we come in. Jobs in the gig economy require talent, passion and the desire to see the world. However, earning, spending and managing the money that you receive after each gig requires that you familiarise yourself with international currencies, foreign exchange and more. That’s where Thomas Cook comes in. In this blog, we’ll discuss some of the amazing gigs that are available for the travelling professional, and we’ll also discuss how you can manage your gig finances and protect yourself abroad, by using Thomas Cook products. So, let’s start with a few jobs for all the travel junkies who want to see the world and earn a living while doing so. What gig will you choose? A destination wedding is a new norm for all the travel enthusiasts. A lot of people ditch the usual wedding shenanigans and flock to exotic locations to get married. From organising the actual event to getting local permits to host a wedding, destination weddings need a lot of planning and precision. If you are good with managing and planning events, then you can become a destination wedding planner and enjoy travelling while being a part of elaborate wedding celebrations. Travelling is not just a perk for photographers, it is a norm. Travelling around the world to capture wonderful shots allows you to earn a decent living. This job allows you to take on a variety of different assignments and visit places that remain unexplored. Modelling is yet another freelance job that takes you around the world. Whether you are shooting for an advertisement or signing an international contract with an agency, this glamorous job will take you places and will also let you be a part of the glittering world of showbiz. This is probably the first job that comes to our mind when we think of gigs that let us earn and travel at the same time. Though travel writing is seen as one of the most aspirational jobs in the gig economy, it requires the spirit of a wandered, the words of a poet and the eyes of an explorer. Though Bartending requires professional training before you take up a gig abroad, this is also one of the more high-paying freelance jobs in the list. 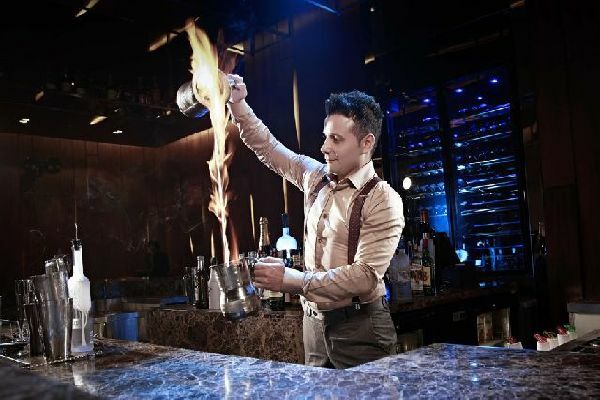 Once you get certified as a bartender, you can work around the world at fancy bars and pubs and explore all the exotic places that you want to. Yoga has garnered a lot of attention over the years all over the world. If you are a certified yoga instructor then go around the world and spread your knowledge about this wonderful form of mind and body workout. Those who are fond of children can work as Au Pair where you’ll need to stay with family and look after the children. You will receive a modest stipend in exchange for your services. It’s also a great way to interact and stay with the locals and learn about the culture from them. English being one of the widely spoken languages in the world, you can easily find some work to earn a decent living while travelling around the world. Some countries have an extremely low population that can speak English fluently. There are great opportunities abroad for people who can teach or translate to English. Though making a living while travelling might sound like a fancy lifestyle, one needs to plan precisely before heading to a new destination and taking up a job. As you will be managing most of your expenses by earning through your freelance gigs around the world, it is important to be meticulous about financial planning, accommodation and work terms and conditions. We list down few of our products that will let you seamlessly blend into the global gig economy. If your job requires travelling from one country to another or if you want to experience a new destination every few months, then the Borderless Prepaid Card is a must for you. Free replacement of card, complete protection from online frauds and thefts, no surcharge on ATM transactions are some of the incredible benefits of this card. This card does not have to be linked with your bank account and hence, you can be rest assured that important bank details aren’t shared or used anywhere else. This is particularly important, seeing that you will get paid from different sources. In case you have any questions while using the Borderless Prepaid Card, you can avail the 24/7 global customer service at Thomas Cook and get in touch with our assistants anytime. An insurance cover up to USD 10,000 is an additional perk which you get on this card. Finally, if you do lose your card, as we’ve mentioned earlier you can have it replaced quickly and free of charge. If you do find yourself low on funds, you can easily request a family member, friend or your employer to reload your card with money. When you travel for work, you might spend quite a lot of time in those far lands compared to the usual vacation. This might require you to save up money to sustain yourself for few weeks or months. If you are travelling on a tight budget or completely dependent on the freelance gig to sustain you, then you will have to manage your finances methodically. Thomas Cook’s One Currency card is a must for you if you are a budget traveller as it helps you avoid currency fluctuations. Some other benefits of this card are zero conversion charges and reusing the unspent amount on the next trip. Waiting for your visa can be a brutal test of your patience, especially when you have to deal with unscrupulous agents who charge you hefty amounts. Also, since you will be travelling for freelance work, visa approval might be a challenge. But with Thomas Cook, you can rest assured as you are provided with end to end visa facilitation, which makes visa application a hassle-free process for you. Freelance work comes with its own set of pros and cons. Thomas Cook will take of the cons for you, while you enjoy the pros. Get in touch with Thomas Cook today and become a part of the fascinating gig economy by doing what you love to do and travelling at the same time.